The Porsche 911 Speedster has been honored with the “Golden Classic Steering Wheel” award as a classic car of the future in the Cabriolet/Roadster category. The 356 unit, limited-edition Speedster celebrated its 2010 world premiere at the Paris Motor Show, ushering in the 25th anniversary of Porsche Exclusive, the company’s very own customization department. Eye-catching unique selling points of the 408 hp (300 kW) 911 Speedster include, for example, the shortened windscreen surround, the double bubble on the convertible top compartment lid and the Pure Blue color. More than 27,000 AUTO BILD KLASSIK readers and autobild-klassik.de users took part in this second reader poll since 2010 on the “Golden Classic Steering Wheel”. Only last year the Porsche Cayenne was awarded the Classic Car of the Future trophy in the SUV/Off-road vehicle category. Bernhard Maier, Board of Management Member for Sales and Marketing of Dr. Ing. 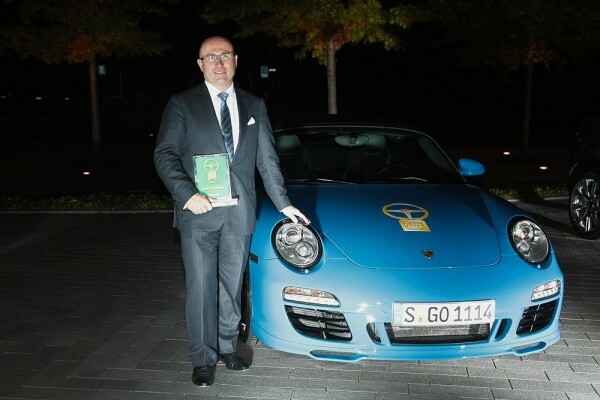 h.c. F. Porsche AG, received the award from the hands of Dr. Hans H. Hamer, Publishing Director of Auto, Computer & Sport at Axel Springer AG. A total of 13 trophies were awarded to the prize winners at a ceremony in Stuttgart. How Many Awards Has the Panamera Won Anyway?